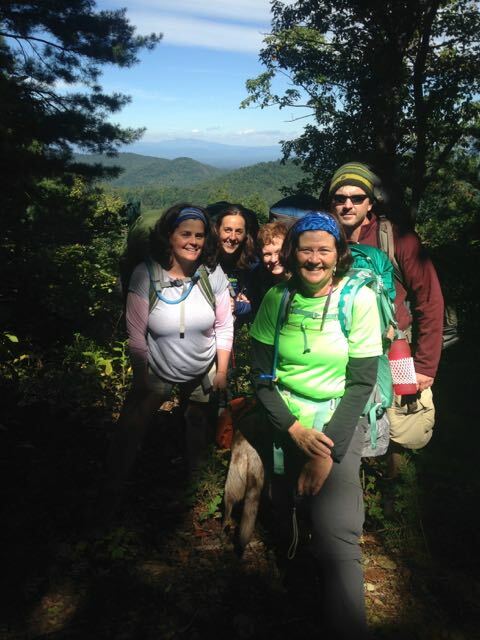 Raleigh’s greenway system: 2014 and beyond - GetGoing NC! 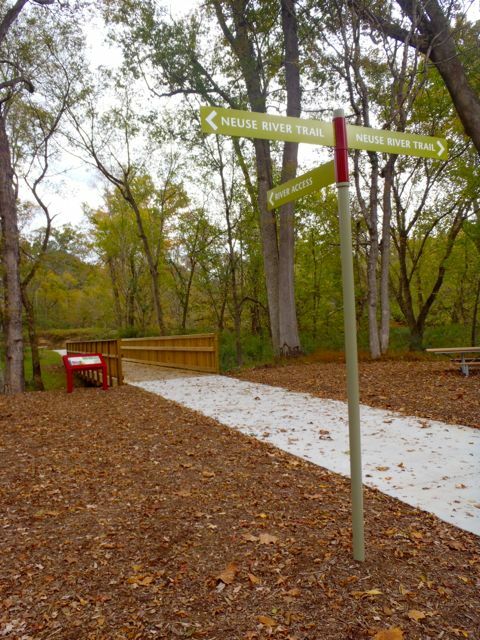 The Neuse River Trail: Backbone of Raleigh's greenway system. Within two years, here’s how your day on the Raleigh greenways might look. You start out on a bike ride at Lake Johnson. Park at the boathouse and take a leisurely (except for the hills on the lake’s south side) lap around the lake before heading down Walnut Creek through N.C. State’s Centennial Campus taking note of all the new construction. Stop at the Farmer’s Market to see if the strawberries are in yet, then continue downstream on some of Raleigh’s oldest greenway. Pass the abandoned E.B. Bain water treatment plant, swing by the Walnut Creek Wetland Center, pass through Worthdale and Walnut Creek parks and head on down to the Neuse River. Here, with about 15 miles already under your belt, you pause to catch your breath and make a decision: north or south? 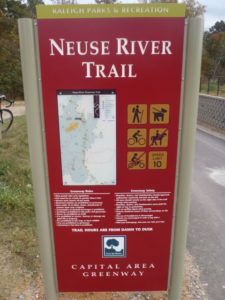 It dawns on you that you haven’t been to Clayton for a while, so you head south along a sylvan stretch of the new Neuse River Trail. After nearly 14 miles you satisfy your Clayton itch, turn around and become so caught up in riding 33 miles of uninterrupted greenway (no street crossings to deal with) that before you know it you’re at the base of Falls Lake dam, the Neuse River Trail finally exhausted. You turn and retreat 17 miles back down the Neuse to the Crabtree Creek Trail. Like the Walnut Creek Trail you started the day on, Crabtree Creek runs west from the Neuse River Trail, about 17 miles into North Raleigh. You stop about three miles shy of the end, though, and head south on the House Creek Greenway, which parallels the Beltline for 2.9 miles before T-ing into the Reedy Creek Trail. You hang a right, which takes you onto the pedestrian bridge over the Beltline into the N.C. Museum of Art, where you take a moment to contemplate Thomas Sayer’s onionringesque handiwork. Then it’s on to Umstead State Park. Now, you could continue through Umstead and hook up on the other side at Lake Crabtree with Cary’s Black Creek Greenway, which meets up with the White Oak Creek Greenway in Bond Park, which takes you almost to the American Tobacco Trail. A glance at the mid-afternoon sun tells you you haven’t time for this 16-mile detour. You turn around and head back down the Reedy Creek Trail, back over the Beltline and through the Meredith College campus (but not before a quick hop across Hillsborough to Ben & Jerry’s). The pedestrian bridge over the Beltline near the N.C. Museum of Art is a vital link in joining Raleigh's greenaways with multiuse paths in Umstead State Park, Cary and beyond. Where Reedy Creek ends at Hillsborough and Gorman streets, there’s a slightly inconvenient 1/3-mile connection you must make on Gorman to reach the Rocky Branch Greenway. 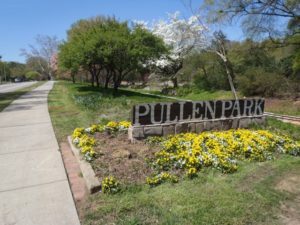 More good sightseeing as Rocky Branch takes you through the N.C. State Campus, past the newly renovated Pullen Park and by Central Prison and Dorthea Dix. At Dix, you pause under a lovely gazebo just off the trail, but not for long because you notice you’re starting to lose daylight. Fortunately, you’re back to the Walnut Creek Trail: Hang a right and it’s only about 7 miles back to Lake Johnson. You get back to your car, unclip and suddenly realize how incredibly tired you are. Little wonder: You just rode 116 miles. All on greenway in the city of Raleigh. Neuse River Trail, 28 miles, 6.5 of which is open. The greenway will run from the base of Falls dam south along its namesake river to the Johnston County line (where it will connect with five additional miles heading south into Clayton). Walnut Creek Trail, 17 miles, 12.3 of which is open. Runs around and south from Lake Johnson, along Walnut Creek, through N.C. State’s Centennial Campus, then through southeast Raleigh before meeting the Neuse River Trail south of Poole Road. Crabtree Creek Trail, 16.7 miles, 12.1 of which is open. Runs from just shy of Ebenezer Church Road southeast to the Neuse River Trail. Reedy Creek/Rocky Branch greenways, 9 miles. 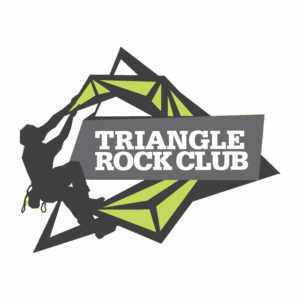 Runs from the Walnut Creek Trail north through N.C. State, Meredith College and the N.C. Museum of Art to Umstead State Park. 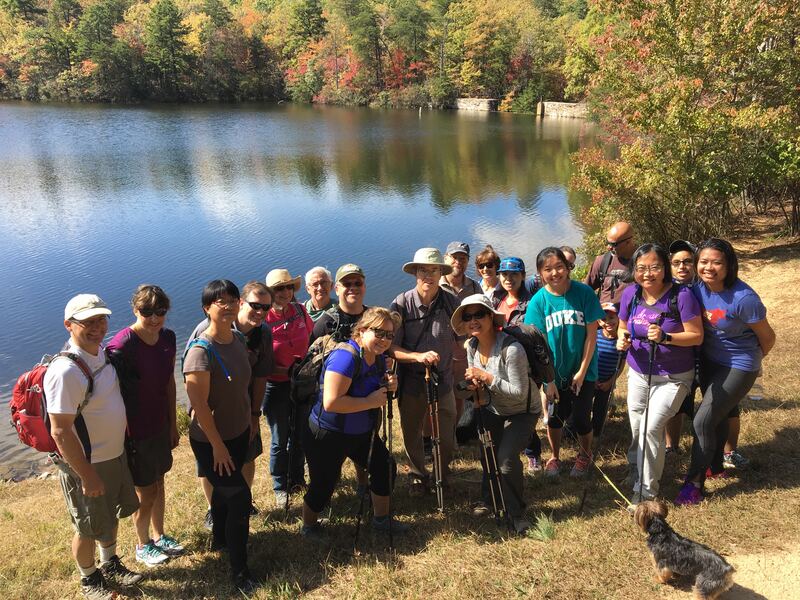 (There, you can take a finely-crushed, tire-friendly trail 5 miles through the park to Lake Crabtree, where you can pick up Cary’s Black Creek and White Oak Creek greenways, which run 11.7 miles total, ending just shy of the 22-mile American Tobacco Trail. 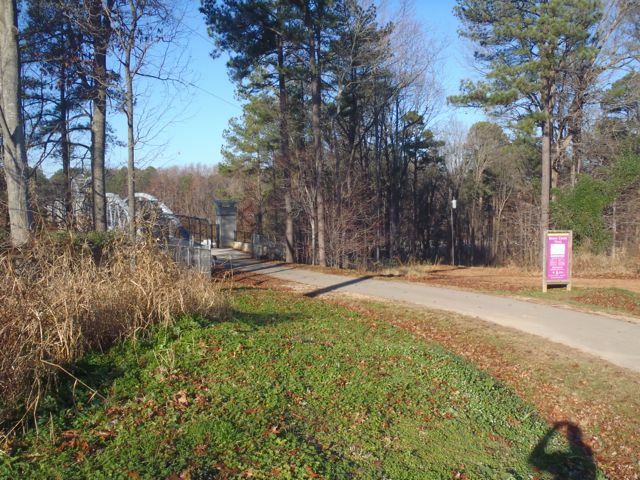 House Creek Greenway, 2.9 miles, expected to open within a month. A short but vital stretch, linking the Crabtree Creek Trail with the Reedy Creek Trail. Mine Creek/Honeycutt Creek greenways, 12 miles. 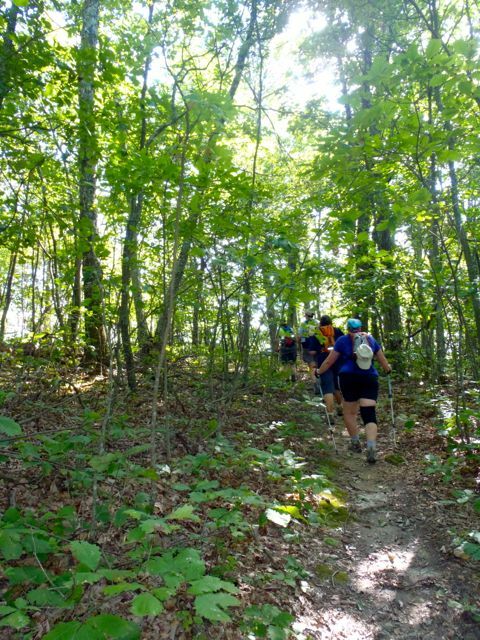 This trail eventually will link the Crabtree Creek Trail with Falls Lake. Currently, the lower 6.55 miles, from Crabtree Creek north to near Six Forks Road, is down; the remaining 5.7 miles to Falls Lake should begin construction this summer. 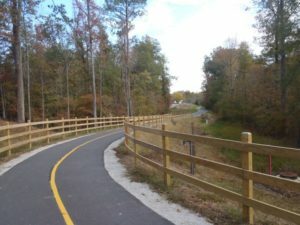 A greenway bike ride from Umstead to Clayton? It will soon be possible. So what happens when the core of the Raleigh greenway system is in place come 2014 and the current $35 million greenway construction boom is completed? For instance, with a growing greenway system comes increased use — and an increase in user conflicts. And it’s not just growing numbers: the paths are popular with a variety of uses, from strollers, to fitness walkers to skateboarders to inline skaters to families out for a leisurely bike ride to fitness-oriented cyclists looking to get in a long workout. Not to mention the fact that as the greenway network takes you to more places, more people use it as a secondary transportation network, taking it to work, to the store, to school. That’s a lot of diverse activity on a strip of asphalt just 10 feet wide. The future of Raleigh's greenways includes more signs to help you find your way. The speed limit on Raleigh greenway, by the way, is 10 miles per hour. Probably not what your typical commuter or fitness rider is clocking on their cycle computer. “Maybe the hours of operation need to be extended in certain situations,” he added. Again, fyi, the greenways are officially open sunrise to sunset. That’s the case for most Triangle greenways, though in the case of greenways used for commuting and transportation in general, hours have been extended. The American Tobacco Trail in Durham, for instance, is officially open until 10 p.m.
A case in point in Raleigh: the pedestrian bridge over the Beltline, which is gated every evening at sunset. Especially in the lesser daylight months, getting home before the gate closes can be a challenge for commuters. One area where the greenways’ growing popularity has already been acknowledged is along the pavement’s shoulders. They’re now 6 feet wide on both sides, including two feet on both sides of finely crushed stone over-planted with grass, a foot-friendly surface that will siphon most runners off the pavement. More directional signs need to go up as well. For the new greenways, signs and maps to help you find your way are standard, as are mileage markers every quarter mile. (Existing trails being retrofitted with mile markers get them every half mile.) Installing directional signs on existing trail will likely require another bond issue, as will new asphalt. 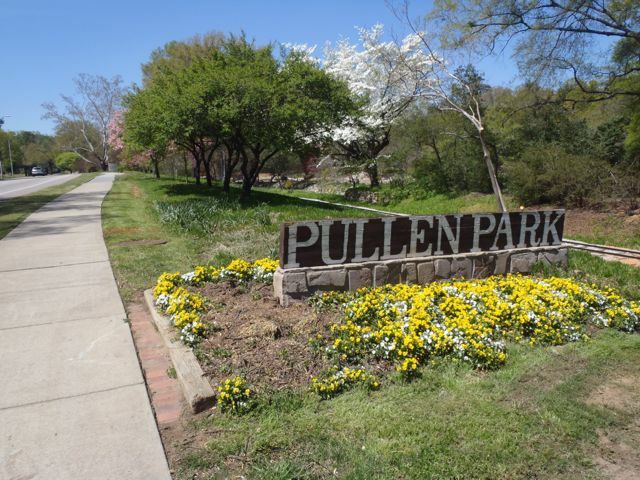 Raleigh's greenways take you to lots of destinations, such as Pullen Park (along the Rocky Branch Greenway). And, of course, there’s the need for more paths, especially in lightly served North Raleigh. Lebsock has more ideas on what he thinks the system needs, but he’s reluctant to share them. He wants to wait and see what the public wants. A public comment period will begin soon as part of the parks and greenway update, a public comment period Lebsock said, “will be the most complete public process you’re gonna get anywhere.” That process is expected to begin mid-summer and take 18 months. The timing is good, wrapping up about the time the current greenway construction frenzy wraps up. Based on what the public wants, Lebsock said they can get to work on the next phase of improving Raleigh’s greenway. Tuesday: Raleigh’s Neuse River Trail: Another 3.5 miles by August, 16.1 miles by November. Today: Raleigh’s Greenway: 2014 and Beyond. Friday: The big picture: A look at how the Triangle’s greenway network will look in less than two years. Is the Crabtree extension to Umstead something that’s been given up on entirely? Last I heard, the project seemed pretty much dead, but I keep hoping. I talked to point man Sig Hutchinson about that yesterday and he said, “I can’t talk about that.” That means there’s some sort of discussion going on, but then there’s been some sort of discussion going on for several years. So … no good news to report.